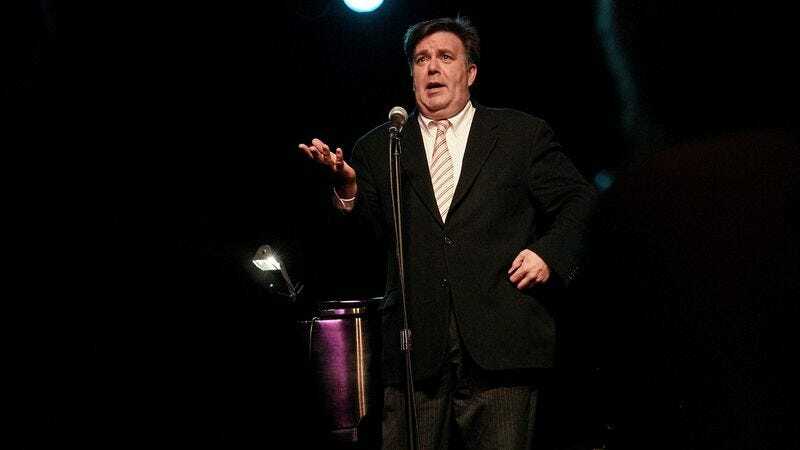 Comedian Kevin Meaney has died. According to The Hollywood Reporter, he was found unresponsive in his home on Friday. Working the stand-up circuit for 36 years, Meaney began his career in Boston and San Francisco in the 1980s. Taking the stage in loud blazers and bow ties, he made a signature bit from a chirpy, chiding impression of his mother, which punctuated personal anecdotes about tight pants and his childhood resemblance to Wayne Newton. Interruption was a big component of Meaney’s routine—as seen in this Tonight Show clip, where the personal material is abruptly and unexpectedly derailed by a vocalist-by-vocalist lip-sync of “We Are The World.” Music was another major part of Meaney’s performances: Before he went on to appear in the stage version of Hairspray, he’d cap his sets with an a cappella showstopper expressing his indifference to bombing onstage. Beyond stand-up, Meaney starred in the original TV adaptation of Uncle Buck, made an appearance in the 1988 Tom Hanks comedy Big, and represented Boston in 30 Rock’s “Winter Madness” and a 2016 episode of Seeso’s Hidden America With Jonah Ray. A vocally dextrous performer, Meaney could be heard in animated programs including Duckman and Garfield And Friends; he was a patient of Dr. Katz, Professional Therapist and, naturally, an overbearing mother on Rocko’s Modern Life. As of a March 2016 interview, his own mother’s words were still finding their way into Meaney’s mouth. Following the news of Meaney’s death, his fellow comedians took to social media to express their condolences and appreciation for an entertainer who claimed he didn’t care, but clearly put a lot of effort into making audiences laugh.